It was an online shop that seemingly had it all: Consistent growth, superb customer reviews across the board, a spot in the 2017 IRUK Top 350 and the “Domestic and General Internet Retailer of the Year” award. But from their experience as a retailer approaching centenarian status, Hughes knew maintaining the status quo would not be enough to keep them at the top of their retail game. What started as a radio repair shop in 1921 has since grown to become one of the leading specialist electronic retailers in the UK. The secret to their success? The ability to anticipate, understand and react to their customers’ needs. “In order to remain competitive in the current retail climate, we realised it’s absolutely vital we have full control over content, including the ability to launch new promotions and landing pages in a matter of hours. Since our former online shop couldn’t keep up with this demand, we decided a relaunch was a necessary next step,” Hughes CEO Robert Hughes said of the project background. With upwards of 6,000 products and over 60 brands represented in the shop, Hughes needed a sophisticated solution that seamlessly connected with their existing business processes and gave their dedicated eCommerce team the freedom to change content on a moment’s notice. According to Enterprise implementation specialist CB Squared, the decision to relaunch using Shopware Enterprise ultimately came down to the ability to flexibly manage content on a massive scale. Next to providing the customer with valuable content throughout the shop, Hughes focused on improving usability. From searching for a product to the checkout and payment, every aspect of the shop was overhauled with the end customer in mind. But with an extensive catalogue of products with complex specifications, each of which are available for purchase, rent or financing, the challenge came in designing a digital journey that met the diverse needs of their customers. 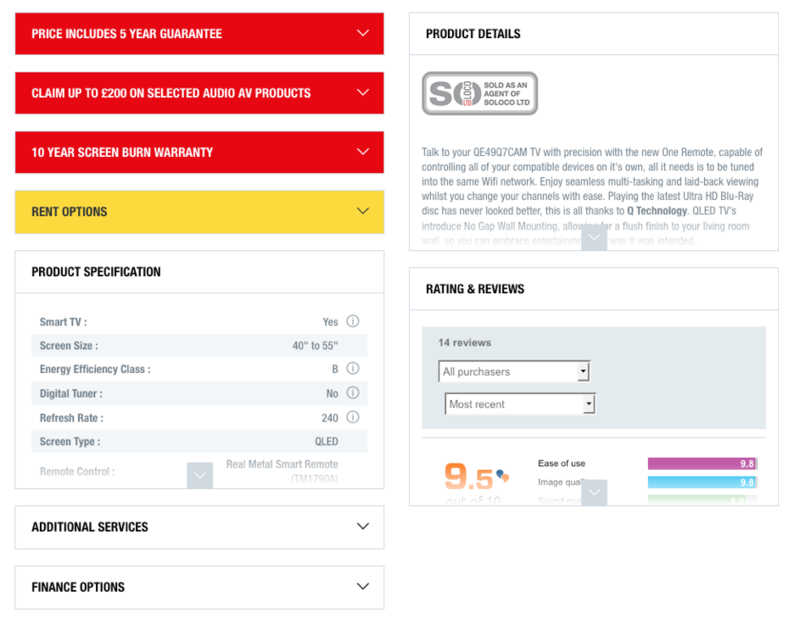 One way this was solved can be seen on the product detail page, where the customer can expand or collapse boxes to view information relevant to their purchasing decision – an effect which is both informative and supported by a clean design. The content of the collapsible boxes includes financing options, reviews, product specifications, product details and additional services that can be easily booked directly through the website. Commenting on the new digital experience of the shop, Mark Howes, Business Development Director of CB Squared said: “Whether mobile, desktop or in the retail stores themselves, Hughes customers expect brand engagement on every level. With this project, we incorporated the competitive strengths that made Hughes so successful in traditional retail, including exceptional service and detailed product information, into the online shop.” Reporting a 5x increase in mobile revenue, the new online presence from Hughes proves the effectiveness of evolving to meet your customer’s online shopping needs. When it comes to searching for products from specific brands, Hughes customers now have multiple resources at hand. Next to a separate category reserved for brands and the ability to filter brands in other categories, CB Squared built a solution so that individual landing pages for each brand can be implemented using Shopping Worlds. This extensive feat was made possible by making clever use of Shopware’s standard marketing functionalities in combination with custom programming. Shopware’s customisation possibilities were another major draw for the brand. Not only was the entire template completely rebuilt to meet the project requirements, but CB Squared made extensive use of Shopware’s open API to build a number of custom extensions. Eager to gain complete control over managing data, CB Squared built a real-time integration with their ERP system. 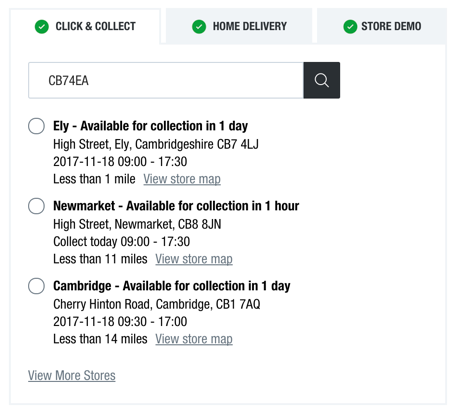 Now when a customer views a product in the online shop, they can see if it is available on display in a specific retail store or for one hour click & collect. For this, the checkout process was also improved to accommodate the requirements of click & collect, once again bridging the gap between service offline and online. The company has also grown to include a special trade division – Hughes Trade – which will be one of the first projects to migrate to Shopware’s B2B Suite. Paul Chisnall, General Manager Hughes Trade: “The B2B industry is going through a digital revolution. The Shopware B2B Suite will allow us to stay ahead of the curve, providing our trade customers with a more efficient and easier online ordering process”. Supported by CB Squared, the Hughes project will be the first B2B Suite launched in the United Kingdom.